Did Russell Westbrook Debut His Next Jordan Signature Shoe? Two colorways spotted in China. After lacing up an exclusive Air Jordan 31 colorway, Russell Westbrook may have debuted his next Jordan signature shoe while on tour in China this weekend. On multiple occasions, Westbrook was spotted wearing the casual high-top believed to be the Westbrook 0.2. The shoe, which matches leaked catalog shots from earlier this year, features a layered suede upper, rounder, more sporty toebox and Air Jordan 1 tooling. Westbrook's "RW" logo adorns tabs on the tongues. The next Westbrook model has yet to be confirmed by Jordan Brand. 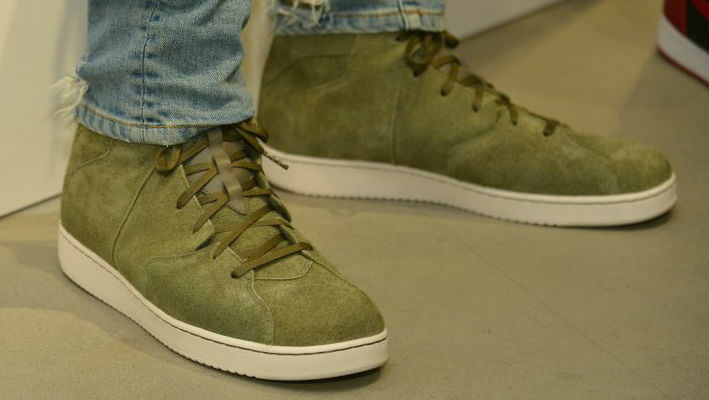 Last year, the Jordan Westbrook 0 launched in July. Keep checking Sole Collector for updates.